Encased in this beautiful rosewood box is a stylish rosewood twist action ballpoint pen and/or wooden pencil that is ideal for your top executives. 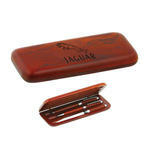 Personalize by engraving your company name and logo on this rich looking pen case. Available in a double or triple pen set.